Why do we love City Bikes? They’re practical, stylish, and affordable transportation for everyone! Sitting upright on a City Bike feels so comfortable that it’s almost as natural as walking. City Bikes come standard with all the things you need for everyday cycling: lights, kickstand, bell, fenders, chainguard, rear rack, and our new bike warranty. Each bike is also well suited to carrying a child on a front- or rear-mounted child seat (sold separately). City Bikes are what we do best, come find yours today! Don’t see the exact model you’re looking for from the brands we offer? We can bring them in by special order, too. Our premiere City Bike from Breezer. The 7-speed Step Through makes carrying extra loads, or climbing hills a Breeze. The smooth-shifting Internal Gear Hub is clean, efficient, and easy to use, while the built in lights, fenders, rack, and kickstand make every trip just a little easier. The flexible and durable chromoly steel frame makes your ride feel smooth as silk. Come see us downtown, to get on a Breezer Downtown. The Uptown is a full-featured city bike with slightly smaller and stronger 26” wheels. It features an 8-speed Internal Gear Hub for smooth shifting and carrying loads. The front wheel dynamo powers your lights, so they’re “always on” when you need them. A built-in frame lock secures your rear wheel, and a fully enclosed chainguard makes sure your dress or pants stay clean while you ride! These bikes take the best of European design, and make them lightweight and efficient for everyday use here in Canada! Our bestselling chromoly steel City Bike! The 3-speed Step Through is an incredible value in a beautiful package. The smooth-shifting Internal Gear Hub is clean, efficient, and easy to use; and three speeds are all you need for most of London. The built in lights, fenders, rack, and kickstand make every trip to the grocery store and beyond fun and easy. Limited quantities available in 2019, get yours before they sell out! The 3-speed Roadster is an incredible value in an elegant package. The smooth-shifting Internal Gear Hub is clean, efficient, and easy to use; and three speeds are all you need for most of London. The built in lights, fenders, rack, and kickstand make every trip to the grocery store and beyond fun and easy. Chromoly steel frame is durable and flexible, giving you a buttery smooth ride. Limited quantities available in 2019, get yours before they sell out! Built on the same frame as the Downtown 3, the Downtown EX features a sport-style 8-speed gear system. Classy and easy to ride with twist shifting, built in lights, fenders, and kickstand, these bikes are an incredible value for everyday transportation! Mixte (pronounced [mikst]) is a direct appropriation of the French word meaning "mixed" or "unisex". Our newest City Bike is built around an aluminium alloy Mixte frame. It’s lightweight, smooth rolling, and will WOW everyone with its clean lines. Perfect for everyday transportation, or Sunday rides on the TVP! Lights, fenders, kickstand, bell, and rear rack included! This bike makes everybody’s soul sing. It has clean lines, comes standard with everything you need to look great when you ride every day! The 3-speed internal gear hub makes your ride smooth and silky, while the comfortable saddle and grips keep you feeling great on your everyday rides. Picture yourself in Europe. You arrive at the train station in Amsterdam, and find yourself surrounded by thousands of beautiful bicycles. Most are matte black. Some are brilliantly coloured. Yet all strikingly similar. What makes European bikes so timeless in their aesthetic and quality? Ask Achielle. The quality, style, and comfort are apparent as soon as you glide on your Achielle (pronounced A-keel) into the street. Every detail is focused on comfort and ease for the rider, with a build quality that can transcend generations. Come visit us to see how a bonafide European bike can change your life. Craighton comes with classic styling, dynamo lights, hub-based roller brakes, a Brooks B67 saddle, a frame lock built into the rear wheel, and an 8-speed internal gear hub. Designed for all-season use. Hand-made in Belgium. Babette is the cool younger cousin of Craighton. Alike in many ways, Babette gives great value with battery lights, a 3-speed internal gear hub, and a very luxurious Selle Royal saddle. Designed for all-season use, the galvanized steel frame and alloy wheels resist corrosion and give that “floating on a cloud” feeling. Hand-made in Belgium, built to last. An electric bicycle needs to provide appropriate support, have good range, and be reliable as well as easy to maintain. However, we tend to forget that such a bike can also be beautiful and elegant. Ernest & Emma are high-quality electric bicycles with the typical Achielle appearance. The ingenious Shimano pedal-assist system supports you in a natural manner and is easy and intuitive to use. Internal Alfine 8-speed hub gear with Di2 changes gears electronically and automatically. Cycling has never been so pleasant and simple. Fuji’s electric Conductor is your perfect transportation solution! Need an extra boost to go a bit further, or carry a little more? The electric motor will remove those excuses and enable you to ride every day. Too wet? Too cold? Too windy? No problem. The comfortable geometry won't put a strain on you as you ride to work or on your errands, and the electric motor give you up to 32 km/h of assistance to help you navigate traffic or that steep hill en route. Shimano drivetrains and hydraulic disc brakes provide crisp shifting and stopping power. The Conductor: not just for those evil trains, anymore. 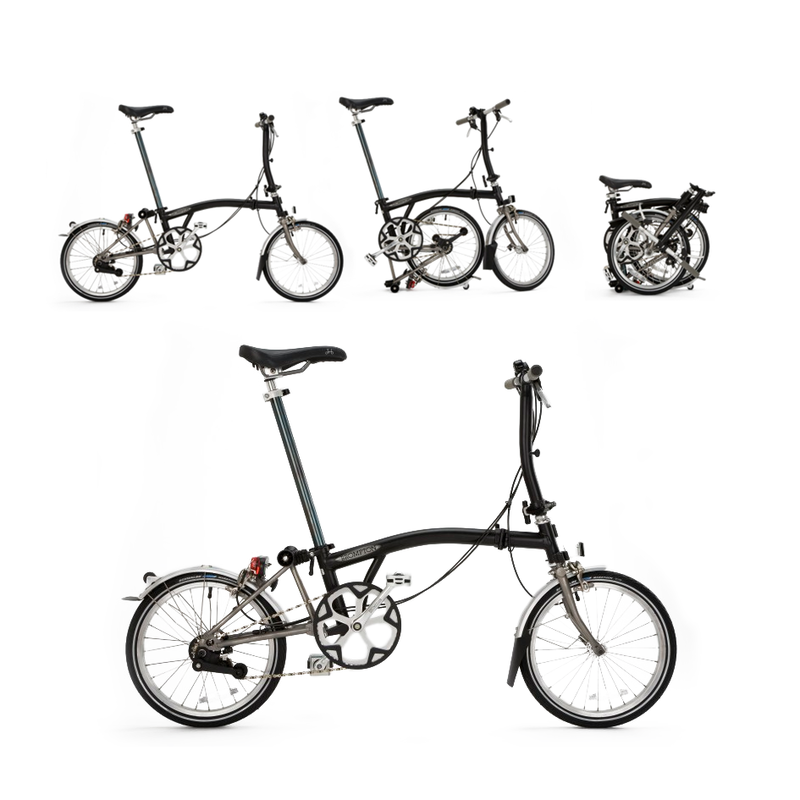 There is only one way to experience the magic of a Brompton - come try one in our store! Your Brompton is your travel companion, every day city bike, and your special way to make your commute a little brighter. Brompton is changing how people experience cities, and travel around the world. Lightweight and durable, with a simple folding mechanism, this bike is designed for your lifestyle. Folded, it fits under your desk, or in a closet, making bike theft a concern of the past. Take it with you in your car's trunk, on a boat, or an airplane; Brompton will become your essential travel companion. Come see us today to learn about the world's best folding bicycle. Love our City Bikes? Check out our Hybrid/Commuter, Single Speed Bikes, Cargo Bikes, Gravel/Adventure Bikes, and Kids Bikes!